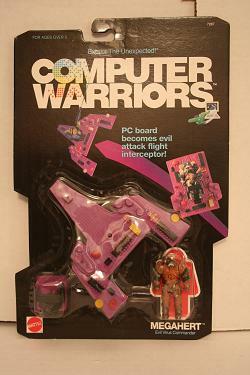 Welcome to carded Computer Warriors figures week at the Preserve! Today we feature the carded example of Megahert, direct to you from 1989 - as always, click the image for a detailed page. Megahert is the leader of the Virus badguys, and does indeed appear to be a very grizzled and tough hombre. The presentation and design on this piece is a great example of why I like this series so much, and why it is a shame it had such a brief time on the shelves.